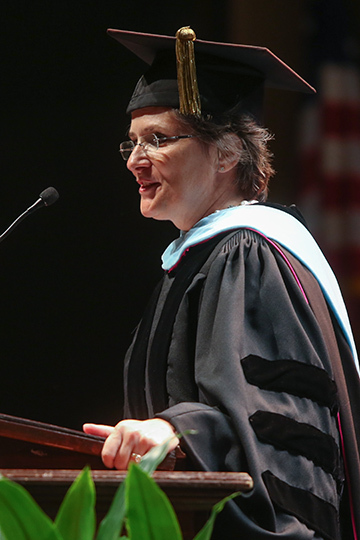 Committed, compassionate people with a common purpose can achieve remarkable results, Jeanna Westmoreland told graduates of Samford University’s School of the Arts and Orlean Bullard Beeson School of Education Saturday, May 14. Westmoreland used a true example from her days as chairperson of the Arkansas State Board of Education to make her point. It was 2006 — not long before she and her husband, Andrew, moved to Birmingham for him to become president of Samford — when a small school district faced a $400,000 budget deficit and prospects of consolidation with a neighboring district. “The only course of action open to the state board of education was to decide which of the surrounding school districts would be the recipient of the students, the teachers and the school’s debt,” Westmoreland recalled. After a local minister suggested that the community raise the needed money and pay off the deficit, residents quickly jumped in with various creative measures. They held raffles, kids emptied penny jars and families took on second mortgages, to name a few. As the deadline neared and funds fell short of the goal, an elementary school student offered $1,000 that he had carefully saved from doing odd jobs and banking gift money. He had planned to use the money for a trip to New York to see the Yankees play. His sacrifice drew national press attention. “As a result of the publicity, donations arrived from places far beyond the small community,” said Westmoreland, a former college education dean in Arkansas who now teaches at Samford and serves as executive director of Samford’s Legacy League. The happy result was that the district met its goal, with $39.56 to spare, and at a special hearing, the board voted unanimously to spare the school. “The audience went wild. It was the greatest outpouring of positive emotion I had ever witnessed,” Westmoreland said, adding that it was better than the closing scene from the classic movie It’s a Wonderful Life. First, you didn’t arrive at this point in your life by yourself, she said. While the young Arkansas student received much of the attention, the actions of many others led to the school being saved. “Likewise, while you’re the ones whose names are in the program, many others have invested in your life,” she said, citing the support and encouragement of parents, teachers, friends and spouses. And third, the most indelible lessons are learned through adversity. In the aftermath of the community’s struggle, many residents spoke of how the effort pulled the town together, how they learned more about their school and the impact of state policies, and how they gained a renewed appreciation of civic engagement. “Community members were proud of their ingenuity and perseverance,” she said. In introducing Westmoreland as the speaker, education dean Jeanie Box noted that it took a special person to represent the schools of the arts and education as commencement speaker. When Westmoreland’s name came up, they knew they had the right person, Box said. In her role as executive director of Samford’s Legacy League, Westmoreland has been instrumental in raising a six-figure amount to support scholarship programs for the two schools, Box said. The ceremony featured the awarding of degrees to 116 candidates in the education school’s bachelor’s, master’s, Education Specialist and Doctor of Education degree programs; and to 51 candidates in the School of the Arts bachelor’s and master’s degree programs. School of the Arts Dean Joseph Hopkins asked the new graduates to recognize their parents and loved ones who have “undergirded and underwritten” their years in school, and to salute the professors who “will be here in the future as we have been here for you now.” The graduates responded with robust applause. Samford Provost Michael Hardin recognized School of the Arts Professor Eric Olson, who retires this year after 41 years on the theatre faculty. The arts and education ceremony was one of seven Samford commencement programs held May 6–14, during which a total of 1,074 graduates received degrees. The ceremonies mark the official beginning of the university’s yearlong 175th anniversary celebration.